For many families and individuals, military service is a point of pride. That pride is made manifest by the awards, decorations, and uniforms that a veteran earned and wore throughout their service. It’s only natural then that many choose to display these objects in their home after their service has ended. Whether you’re fresh out of the service or are displaying your medals for the first time, you might be looking for some clever ways to display these awards. Today, Patriot Angels will offer a few ways you can proudly display the medals from your military career. One of the most eye-catching ways to display your medals and awards is on a mannequin. Clothe the mannequin in a dress uniform, and arrange your medals and ribbon rack accordingly. This is a great way to remind yourself and others of how you carried yourself during your service, and it’s a great way to keep your uniforms from growing musty in the back of a closet somewhere. You can display the mannequin in an office, on a shelf, or wherever there’s room. Your living room is a natural gathering spot for friends and family alike. It’s only natural then to display your awards there with a glass top coffee table. Many models have glass tops and recessed spaces. Line the recessed space with a nice fabric or cloth, then arrange your medals and awards as you see fit. The glass allows you to easily view your medals throughout the day while protecting them from errant spills and food stains. The size of the coffee table can vary to fit the room it’s in, but larger coffee tables allow you to display more objects, like photos, letters, and more. One of the most popular ways to display your ribbons, medals, and awards is a shadow box. These boxes can be lined with a nice fabric that is reminiscent of the material your dress uniform would have been made of. Shadow boxes come in a variety of sizes, allowing you to display as many awards as you’d like, or to highlight just one or two of the most meaningful awards. You can arrange the medals as they would have been worn on the uniform, or chronologically in when you were awarded them. 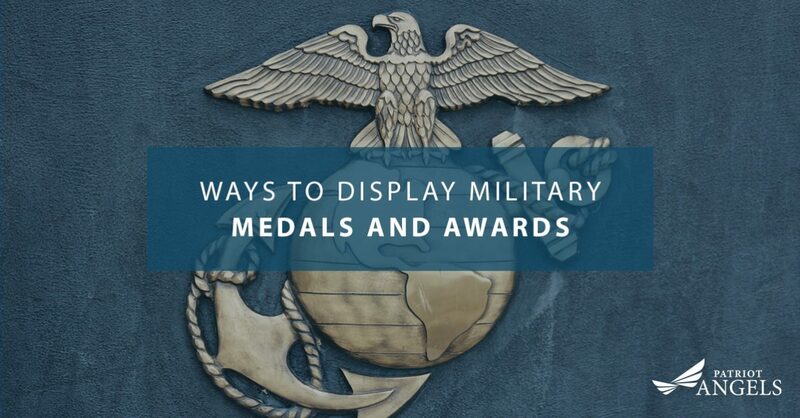 For some, they might dedicate a wall in their office or living room to tastefully arrange their medals, decorations, and photos from their service. This allows you the chance to construct a narrative of your service by including important photos and letters. Your military service or the service of a loved one is a lasting legacy for your family. If you or a loved one who served are in need of long-term medical care, Patriot Angels can help connect you with the resources and services you need to ease these burdens. We can help you apply for the VA Aid and Attendance Pension. Contact us today to schedule a consultation and to find out more.